Something about this traditional living room space caught my attention. Yes, the burnt orange hues and deep pinks are a striking element of the scheme, but it was more than that. The billowing, almost elongated drapes are a nod to the dramatic height of the room, whilst the oversized, circular ottoman hints that the space is for relaxing in, despite the otherwise formal furniture. Finally, the well-balanced colour palette is demonstrated through the addition of olive green and blue shades that break up the louder orange and pink hues. What elements of this scheme do you like best, friends? I am loving that pink chair! Oh love love love! Agree with Kathryn, that chair is amazing. And the whole thing is so inviting isn't it? Absolutely love that the drapery panels don't match! I don't think I've ever seen that before...very cool! So bright! Really cool though. The place you shared that is perfect for taking a rest. That is so bright and really cool room among all your photographs of your rooms. Just adore this room Will! 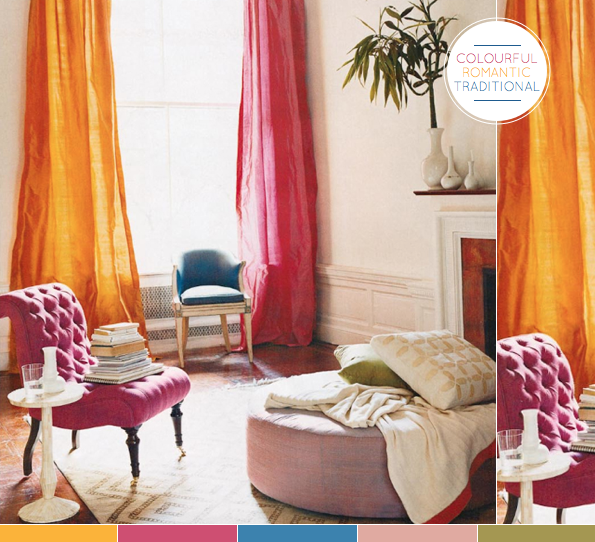 Drapes are amazing ... and the colour palette just works so well. I love that tufted chair - the pieces are so traditional and dramatic but the lack of clutter and bold color scheme keeps it so fresh! Button back chairs just make me want to sink in and recline with languid abandon. I don't usually do pink but I'd happily make an exception in this case! I think you described it very well Will :-) I like the round shapes of the furniture, no hard edges. I really want a pick/fuchsia tufted chair! one day i will get it!! How many elements have I to choose?????? I love all in this styling!!! !May be .... curtains and their colors! Very very cool!! What a happy space! Love the use of colors here. The pink turfed chair is my favorite! Love the colour palette used in this space; the loud orange and pinks, cleverly mixed with the softer hints of olive and dusty pink are just gorgeous! I can't choose just one thing! Not a spot of art and still beautiful. That's hard for me to say! This colour scheme is brilliant.